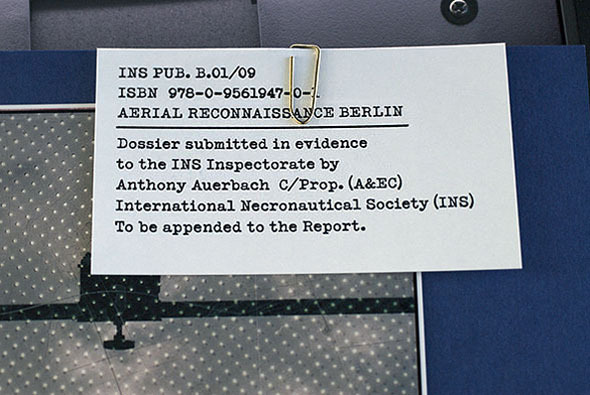 Anthony Auerbach’s Aerial Reconnaissance Berlin documents a series of investigations for the International Necronautical Society (INS) Inspectorate. The dossier displays the results of five aerial surveys carried out in Berlin alongside a wealth of collateral material. Auerbach demonstrates the technique of very low altitude aerial photography he adapted for necronautical research and explains how the target sites were identified according to the INS’s central concerns: marking and erasure, transit and transmission, cryptography and death. The dossier further highlights the configurations that would merit further analysis: death and air, counting and telling, failed revolutions and empty tombs. To be appended to INS General Secretary Tom McCarthy’s forthcoming Report to the INS: Berlin: World Capital of Death.